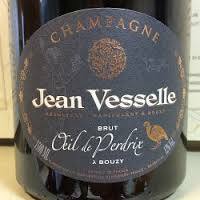 The Vesselle family have been grape growers in Bouzy for nearly 300 years. Their 37 acres of vineyards are planted to 90% Pinot Noir and 10% Chardonnay. Farming is according to lutte raisonée principles, concentrating mostly on organic practices and avoiding chemical treatments. Vineyard rows are plowed to avoid the use of herbicides. The estate too uses solar energy and recycles rainwater to reduce its energy footprint. Soils in general are the classic chalk of the Montagne de Reims. Grapes are harvested exclusively by hand and pressed gently, then fermented in temperature-controlled, stainless steel tanks. An estate bottled 100% Pinot Noir (all from Bouzy) cuvee from 15-30 year old vines farmed according to lutte raisonée principles. Grapes are macerated briefly for color then pressed (which is the original but now very rare way of making Rosé Champagne) and fermented suing indigenous yeasts in stainless steel tanks. Aged for three years on the yeasts and dosed to 6 grams per liter. Pale-salmon in color; dry, medium full-bodied with fresh acidity and light phenolics. Supple and riper but still fresh. Lovely red fruit with a hint of citrus and a sort of earthy minerality. Has a sort of red wine sensibility. Fine Food Fizz. Delicious. BearScore: 92. An estate bottled blend of 80% Pinot Noir and 20% Chardonnay all from Bouzy farmed using lutte raisonée principles. 15-30 year vines, fermented on indigenous yeasts in temperature-controlled stainless steel tanks. Aged for three years on the yeasts and then dosed 10 grams-per-liter. Straw with a hint of copper; dry, medium-bodied with fresh acidity and light phenolics. Supple, but still fresh, rounder style of brut Champagne with red fruit and more citrus. mineral earth and the right level toast. Stylisticly in middle. BearScore: 91+.